Expertise Areas: Academic and educational services, consulting Services, marketing, international development services, creative industries, public relations and communications, start-ups, textile and apparel, luxury. 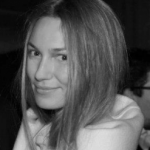 Marisha Ziurina has professional experience and expertise in the fields of Luxury & Fashion Brand Management and Strategic Consulting to MSc Fashion Marketing, Design & Brand Strategies class. Marishka Ziurina is Luxury and Fashion Brand Consultant at 7TWENTY based in Paris and South East Asia. 7TWENTY provides strategic consulting and communication services for prestigious and emerging international Fashion and Luxury brands. Marishka Ziurina gives advice and supports on innovative projects adding real value for brands in the following areas: brand identity and positioning strategy; product creation strategy, image and design; styling; commercial development: marketing and pricing policies, distribution strategy and support on entering Asian markets; communication strategy: notoriety and brand awareness, story telling, PR and event strategy; digital development, social media strategy, e-commerce and mobile applications.